Christmas vacations are for having fun. I did have fun! I completed a project that had been sitting idle for some time: The Energy Monitor for the house/office. The project is described over a few other posts. Most of the theory and practical application is explained in detail at openenergymonitor.org. I adapted their circuits for my purpose: North America 120 Volts main and 5 sensors measuring various current drains. 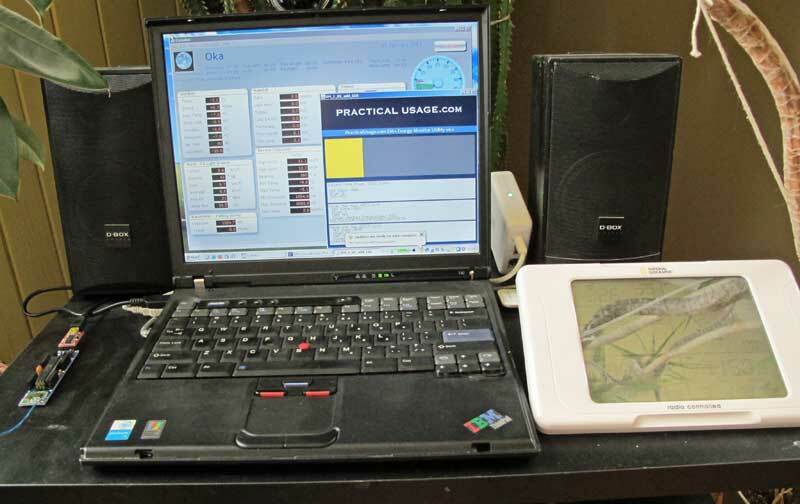 What I added to the project is the use of Processing (processing.org) language to develop a user interface and a data logger. The EM-1 is made up of two parts: the Sensor/Sending unit and the Base/Receiving/Processing unit. The hearth is the sensor/sending unit. The picture shows (left to right): A 10 volt transformer, the connection board, the Arduino micro-controller (actually a Jeelabs Jeenode V6). The transformer is used to compare readings to a known source (mains voltage varies by up to 10% here!) and use the measured voltage to compute power values. It is also used to measure the sine wave form of the alternating mains voltage. This is then used to compute real power usage versus apparent power usage. It could also be used to power the jeenode but since I have a ton of 5Volt transformers, I used one of those to supply power to the circuit. The connection board is used to connect the 5 sensors to the micro-controller. Two sensors measure the whole house/office power consumption and the 3 other measure various current drains. The board is made of two parts. 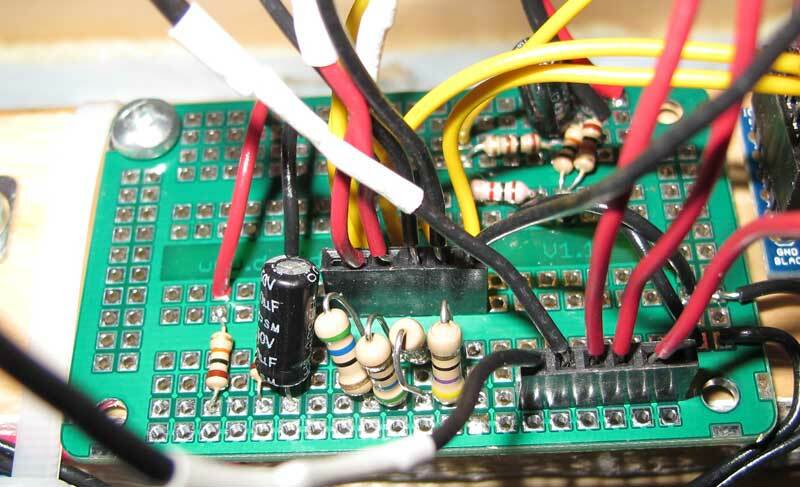 The first part is a voltage divider that takes the 10 volt power supply output and reduces it to about 1 volt, which is then used to drive the analog pins on the micro-controller. The second part is the sensor connection terminals. It’s made of a few resitors (burden resistors) and jumpers. Nothing complicated, but a lot of calculation was necessary to make it work. The micro-controller serves two purposes: it measures the sensor inputs and transmits the measurements using a wireless radio. The board is an Arduino compatible micro-controller that happens to have an integrated transceiver, the Hope RFM12B. The program running on the Jeenode is then made of two parts: the first one computes power values bases on the sensor inputs and the second part sends the computed values to the EM-Base unit. The EM-Base unit is a standard Jeenode connected to a USB port on a computer. No hardware modifications. The key to the Base is the software. The Jeenode receives data from the EM-Sending unit. It then sends that same data on the serial port. A Processing program waits for data to show up on that port and process it. A few things happen. The data is interpreted and a graphical indicator is showed to indicate the present Total Power for the two main sensors. The other sensor values are put into the first window. Two more windows show the total power used, in Watt/Hour for the current hour, the last hour, the current day and the previous day. The power data is written to a file every ten minutes. Each record contains the power totals (apparent and real) for each sensor for the last 10 minutes. The record also contains a time stamp. This entry was posted in Arduino, EM-1 and tagged jeenode, sensor, wireless. Bookmark the permalink. Can the EM-1 be readily adapted to 240V/50Hz power? 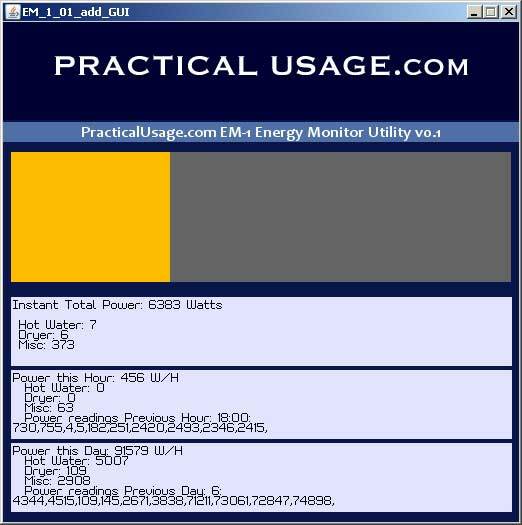 The Energy Monitor project is developed for 220-240 Volts originally. I adapted it to 120. Take a look at openenergymonitor.org for more info. As far as my Processing software goes, it will readily accept power data from any voltage source. The power readings received are processed by the sending units.